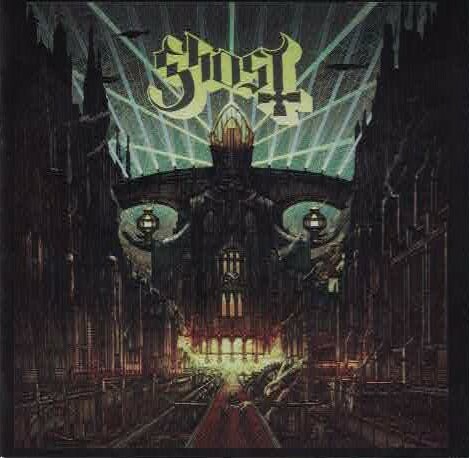 Ghost have been somewhat of a favorite band of mine for about four years now ever since I first heard their debut album Opus Eponymous. Their sound is an inventive mix of Blue Oyster Cult and Mercyful Fate and their imagery is unlike that of any rock band around today. Three albums into their career the members of Ghost are still only known as "Papa Emeritus III and a Group of Nameless Ghouls." The singer dresses like an "anti-pope" and the rest of the members wear horned masks. I don't know who they are and I'm okay with that. I don't want to know who they are. Their imagery is fantastic. It's worth buying a CD of theirs just to look at the artwork and watching them live must be really something. Their first album is an all-time favorite for me and I listen to it quite often. Their second effort didn't quite capture me as much. I think I only listened to Infestissumam once. I plan on revisiting it again, but right now I'm enraptured by Meliora. What I really love about this album is that all of the songs are singable. Papa Emeritus III's vocals are in exceptional form. He sings clearer than just about any other rock or metal singer around. It's easy to understand what he's singing. And what he is obviously singing about is Satan. Never has the praise of Satan ever sounded so melodic and beautiful. Just listen to He Is. I could swear that ELO and The Beatles had an influence on that song. It's so brilliantly layered. I've listened to the song three times today and each time I've heard something different. Mummy Dust, the song that follows He Is, could possibly be the heaviest song on the album. It's also as majestic as Zeppelin's Kashmir. The chorus could have been a bit better, though. Mummy Dust is ever so close to being my favorite song on the album, but that chorus doesn't really grab me. Cirice has an incredibly strong introduction that's easily one of the most evil-sounding riffs of the year and the rest of the song builds on it. Cirice is probably my favorite song on here next to He Is. Deus in Absentia is something almost Queen-like with the operatic background singers and the way the guitar strings bend during the solo, but the ending is especially haunting. It's tough to really compare Ghost, though. Especially on this album. While I still thought of BOC and Mercyful Fate on this album I really didn't hear it as much. I heard a different monster. At this point I don't think there is a single band Ghost sounds like other than Ghost. Meliora is much better than it's predecessor. This band has really grown since then into a mature group of Antichrist-loving Nameless Ghouls. 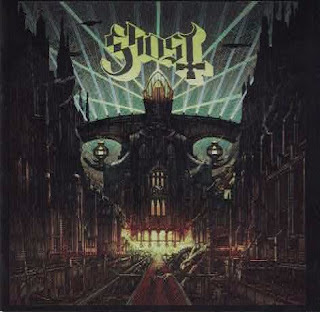 If the world is on fire and the Antichrist has returned then there couldn't be a better soundtrack to it than Ghost's Meliora. Although their first album would work, too. This album, I'd say, is at least as good as their first. Maybe even better. I'm not sure yet. You better pick it up soon before the world really does end.